Let’s start with “Spring” bingo from the Making Friends Website, since its well suited for preschool aged children. The game comes with both call-out cards and 12-4×4 card printable boards that can be printed out on card stock or just laminated. 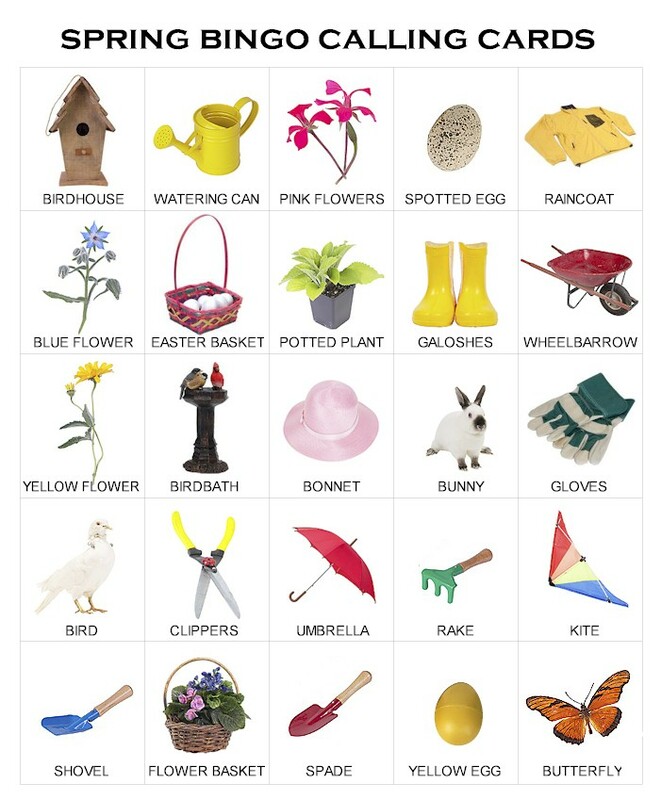 Spring vocabulary words include: kite, butterfly, birdhouse, bird, birdbath, watering can, pink flowers, yellow flower, blue flower, flower basket, potted plant, spotted egg, yellow egg, rain, raincoat, umbrella, galoshes, bunny, Easter basket, wheelbarrow, bonnet, gloves, clippers, shovel, spade. Next up are the “Insects and Bugs” as well as “Parts of Plants and Trees” from Boggles World, suitable for school-aged children. Both come with call-out cards as well as 3×3 and 4×4 card generator/boards. Clicking the refresh button will generate as many cards as you need, so the supply is endless! You can copy and paste the entire bingo board into a word document, resize it and then print it out on reinforced paper or just laminate it. Practice Isolation of initial, medial, and final phonemes in words ( e.g., What is the beginning/final sound in branch, nut, plant, etc?) What is the middle sound in root, seed, moth, etc? Practice Categorization skills via convergent and divergent naming activities: Name Spring words, Name Insects, How many trees which grow flowers can you name? Practice providing Attributes via naming category, function, location, parts, size, shape, color, composition, as well as accessory/necessity. For example, (I see a fly. It’s an insect. You find it outside or inside. It’s black and is the size of a bee. Practice providing Definitions: Tell me what a butterfly is. Tell me what a shovel is. Practice naming Similarities and Differences among semantically related items: How are dragonfly and ladybug alike? How are they different? Practice explaining Multiple Meaning words: What are some meanings of the word fly, bug, branch, plant, etc? Practice Complex Sentence Formulation: make up a sentence with the words birdbath and unless, make up a sentence with the words wheelbarrow and however, etc.